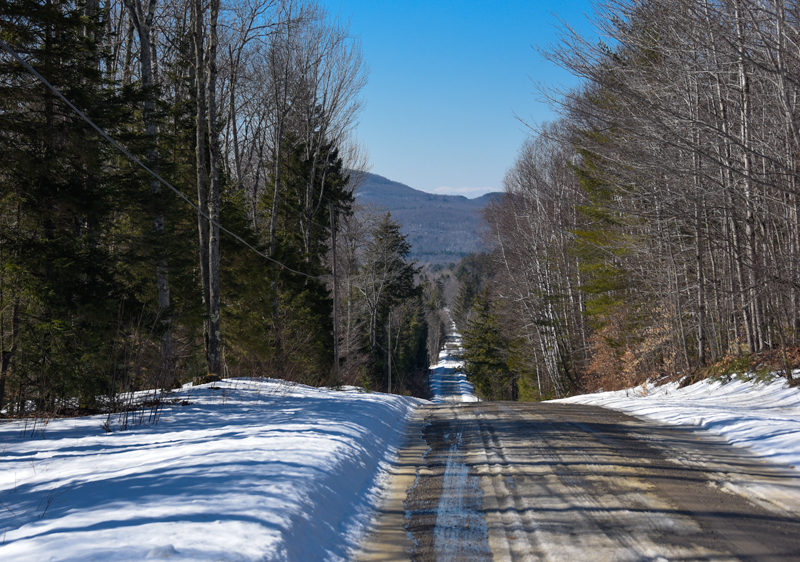 Steam Mill Road heads into the mountains near Bread Loaf in Ripton, Vermont. It’s surprisingly difficult to see with the eyes of a child, but it’s a very good way to paint. For the maturing artist, there’s always more to UNLEARN. A sense of wonder is good for kids of all ages. It’s satisfying to put the brush down after a long day of painting and know I have given it my all. But the story isn’t over when I’ve signed my name to the painting. It turns out art has an amazing ability to connect us, to ourselves and each other. 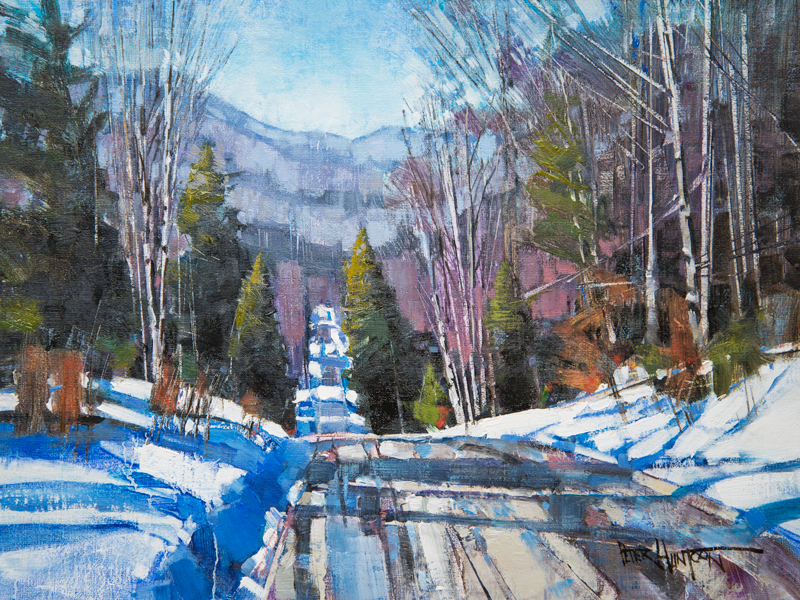 For me, connecting with nice people who share a love for art and Vermont is icing on the cake. I’m convinced that each work of art finds its rightful home. Serendipity or fate, somehow the universe conspires and the stars align to bring us together. The internet helps too, I suppose. Maybe the art finds a home, or a home finds the art, but it always seems like it was meant to be. 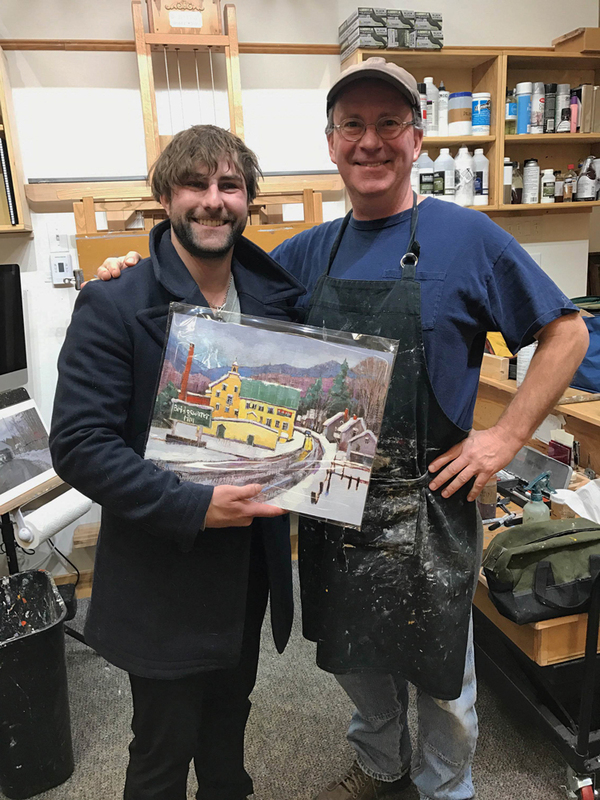 In the photo below, my new friend Collen Doyle picks up his new painting “Bridgewater Vermont” at the studio. Collen bid and won the Day in Vermont auction a few weeks ago. Collen grew up in the Bridgewater area and now hosts the Woolen Mill Comedy Club there. Thanks Collen, for another happy ending! I love this! I love the colors, the mountains, the trees, the road & that view! Peter, just wanted you to know that my sister and brother in law (from Miami) host a family gathering Christmas Eve at the Hop N’ Moose and my husband and I are on our way to Miami tomorrow with a framed print for them so they have a piece of home! Thanks for the wonderful work you do and the memories you capture! Wonderful, thank much Kathi, I too love HopNMoose! Safe travels! Love the sense of space, the notes of purple, and those electric blue shadows. Nicely done! Southern lower Michigan has been devoid of snow for weeks now. Had to drive to Ontario to go cross country skiing. Good to see a slice of real winter. Great job Peter ! however , I would like to see the snow shadows a little softer. The rest of the picture is wonderful . Thanks Jacquelyn, glad you like some of it. I do paint with conviction! wonderful picture! Instead of Steam Mill Road, I think it should be called Rollercoaster Road! That’s what it felt like up there looking down. Thanks Vivian! I have been following you for awhile and this is my ALL TIME favorite !!! I grew up in Vermont, went to UVM, still have family there, but am in SC now, and this scene just says Home. My pleasure Cindy, thanks for all your support! Love this one! Rich color and horizontal shadow lines create a powerful entrance into this painting. Then the eye swoops and plunges, so to speak, between stately vertical trunks of trees, and ever downward through the long rolling valley and into the distance. If it weren’t for the danger of auto traffic, wouldn’t that stretch of road make an exhilarating toboggan run! You pretty much nail my intention every week Brian, well done! The traffic danger here would be pretty low. I saw one other vehicle the hour or so I lingered there. Wonderful words, Brian. Indeed we look into the depth of a snow covered wide rangy forest. The sun evoques all colored blue shadows. It’s really bright and brilliant´. For me it’s also like a countryroad near my own hometown. In the first moment I thought in German : “Das habe ich schon einmal gesehen, das ist wie mitten im Spessart…” (I’ve seen this before, this is like in the mid of the Spessart – a low mountain range in Germany). What a lovely painting! My husband and I vacation often in Vermont and we so appreciate those who can capture landscapes like these. I’m an artist, too, alas I do not have the talent for creating portraits or landscapes. Instead, I have a deep love for cartooning and a fascination for insects of all kinds. I’ve sort of combined both of these interests on my “bughouze” website. It’s not fine art, but it does keep me laughing. The world needs artists of all shapes and sizes, perhaps now more than ever. Thanks Janet! Love the shadows and the way the road takes you on a journey to the mountains. As usual, Peter, I love your use of color. Despite the feel of the winter cold, I feel a slight warming in you early March painting. Yup, it’s right around the corner Deanie. If we can’t feel the warmth yet, we can see it in the quality of light. Thank you! 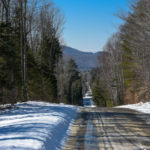 Great depth the road to the Notch…….I got Spring Fever Peter! Trout season is ah coming get your line ready……..
All the Best ….ol ‘friend Love your work. Rick. Oh, Peter you always find a (lonely) place to show the peaks of the nice state of Vermont. And then you find the hidden colors of these places with or without the sun. But in this case the sun points out jewels in the snow.